Not very different from the soviet and eastern bloc 7.62x39 ammo that was prodigious in the 70’s, 80’s and 90’s in the U.S.A. as mil-surp. This is slightly different looking, but it operates much the same. The reliability and cost are in line with the old surplus stuff, but it burns a bit cleaner, and it offers a soft point, which wasn’t as common as the FMJ stuff in bulk. Sure it’s called something different now and instead of a burnt orange or green, or brown case, it’s the familiar galvanized silver look of zinc plating. But the performance is spot on. The price is compelling, and the reliability is excellent out of AK/Clones as well as some of the newer, usually somewhat finicky AR/clone builds that want to take advantage of this great cartridge. The 7.62x39 is like a .308 Winchester “light”. It offers solid performance, a decent sized projectile and good terminal ballistics. More than anything: it’s a proven entity; not only because of the AK platform, but as a standalone cartridge. It just makes sense, especially when ammunition can be sourced this cheaply. Suitable for any 7.62x39 firearm, but is really well suited to AK/Clones. Q: Will this pass the magnet test? A: Hello Roy, This Silver Bear ammunition is loaded with a lead core, bi-metal jacket projectile. Due to the steel content in the bi-metal jacket, this ammunition will not pass any type of magnet test. A: This Silver Bear 7.62x39 is non-corrosive ammo. Q: Is this considered to be corrosive ammo or non-corrosive? A: The primers used in this Silver Bear ammo are non-corrosive. Q: Would these be suitable for hunting? Thanks. 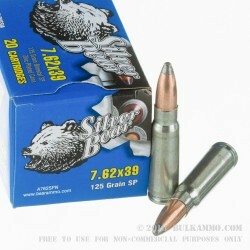 A: Yes, these Silver Bear 7.62x39 soft point rounds would work well for hunting. They should expand while still retaining weight in most light, thin-skinned game such as deer. Q: Question: Is this "good" or "dirty" ammo by American standards? I have heard this ammo is fine, and I have heard that it is 'junk - don't buy it". What are the facts? I guess the larger question would be is the Russian ammo "good" or "dirty"? Thanks. A: What would be your standard? 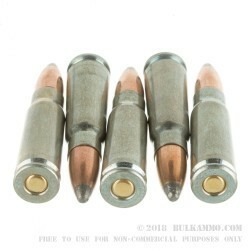 In 7.62x39, this is considered to be good, serviceable ammo and will function reliably in a wide variety of firearms. It's a tremendous value. If you have a 7.62x39 rifle, chances are it's based on a Russian design - why not shoot Russian ammunition through it? Q: How does the zinc plated steel compare to a lacquered steel for corrosion and performance? I've had lacquered steel Wolf 9mm stick in semi-autos, possibly due to our hot/humid environment in FL or maybe inconsistencies in manufacturing. A: The zinc plating is slightly better for corrosion resistance than the lacquered steel. However, any steel will eventually corrode if stored improperly. Q: Is the energy for this round in the same ball park as a 30-30 so that it could be used to hunt white tail deer? A: Though not identical, the performance of 7.62x39 is fairly similar to the performance of .30-30, and can be used to hunt white tail deer. Q: Would the soft point of these rounds make them more suitable for hunting? If not, which manufacturer/model should I look for? 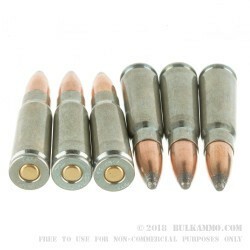 A: Yes, these soft point bullets are more suitable for hunting than 7.62x39 FMJ ammo. Q: Are these hollow point? A: No, the "SP" in the title stands for "Soft Point." These projectiles have an exposed section of the lead core at the front. Q: Is Brown or Silver Bear ammunition manufactured by the same company as Prvi Partizan ammunition and what is the quality/component difference between the two? A: Brown and Silver Bear ammo are manufactured by Barnaul in Russia with steel cases and bimetal (steel/copper) jackets. Prvi Partizan ammo is loaded in Serbia with brass cases and copper jackets. A: This would be a good choice for hunting deer out of either an AK or a Mini-30. Q: I was wondering if you think the SP would pose any problem feeding into an Norinco SKS? A: No, your Norinco SKS should not have any problems feeding this soft point ammunition.